K&M HAVE SPENT 3 YEARS DESIGNING AND DEVELOPING A MULTI PURPOSE YARD SHUNTER. THE ORIGINAL CONCEPT WAS PURELY TO UTILISE AN OLD DENNIS RCV TO MOVE OUR TRAILER STOCK. WE SOON ADAPTED THE DENNIS HYDRAULIC SYSTEM TO POWER AND TEST TRUCK MOUNTED CRANES AND TIPPING TRAILERS. THE LOW ENTRY AND MODIFIED CAB ACCESS MAKE THE SHUNTAIR THE SAFE AFFORDABLE CHOICE. INSTEAD OF USING CONVENTIONAL, HEAVY, & VERY EXPENSIVE HYDRAULIC POWER TO LIFT THE FIFTH WHEEL WE HAVE ADAPTED A FIRESTONE “AIRSTROKE” AIRBAG WITH THE CAPACITY TO LIFT 13,500 KGS AT 7 BAR PRESSURE & 15,500 KGS AT 8 BAR PRESSURE TO RAISE THE FIFTH WHEEL BY 255MM. GENEROUS OVER CAPACITY FOR A SINGLE 10,000KG RATED DRIVE AXLE. THE FOLD DOWN ARM SUPPORTING AIR BRAKE SUZIES, ELECTRICS & HYDRAILIC QUICK COUPLERS ALSO ACTS AS A SAFETY BARRIER TO THE “CRUSH” ZONE & MUST BE LOCKED IN THE DOWN POSITION TO RELEASE THE PARK BRAKE SAFETY INTERLOCK & ALLOW THE TRUCK TO BE DRIVEN. TO CONVERT A STANDARD TRACTOR UNIT FOR YARD SHUNTING DUTIES, JOST OFFER A BASIC DUAL HEIGHT FIFTH WHEEL KIT (RO*66 LA) LESS PTO/PUMP & FITTING FOR £15,000.00 AS OF JULY 2014. WITH SUCH A CONVERSION THE DRIVER STILL HAS TO ENTER/EXIT THE CAB IN THE CONVENTIONAL MANNER & CLIMB UP/DISMOUNT TO/FROM THE BACK OF HIS UNIT TO ATTACH/DETACH AIR LINES ETC. 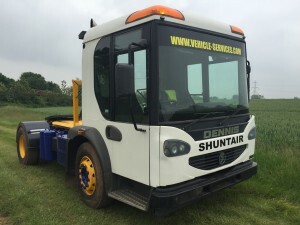 IF THE CHASSIS IS FITTED WITH A HYDRAULIC KIT AS WITH A STANDARD RCV THERE IS THE ADDED ADVANTAGE OF A UNIT ABLE TO POWER A BULK TIPPING TRAILER OR TIPPING SKELETAL TRAILER. IF ROAD LEGAL WE ARE WELL ON THE WAY TO PRODUCING A 5TH WHEEL MOUNTED RECOVERY UNIT CAPABLE OF LIFTING/TOWING ANY DISABLED UNLADEN TRUCK/TRAILER. THE ADDITION OF A VBG DRAWBAR COUPLING GIVES A HAULIER THE FLEXIBILITY OF HAVING A YARD TRAILER SHUNTER C/W HYDRAULICS CAPABLE OF OPERATING A TIPPING TRAILER OR LOW LOADER HYDRAULIC NECK, A TUG FOR DRAWBAR OPERATION & A RECOVERY TRUCK ALL ROLLED IN TO ONE VERSATILE UNIT. Videos of the unit in action can be found Here. All feedback welcome.